On this occasion the ‘Stare of the Dog’ was fixed firmly on the bottom of our road, where the annual street party was gathering momentum. Given his only contribution thus far to the event had been to half eat the invite as it dropped through our post box, we decided the best place for Dudley was at home, so we left him peering forlornly through the window at the frivolities from afar like a hairy Cinderella. By now in its tenth year, the street shindig has become a thing of legend, with this season’s bash offered a ‘Cowboys and Indians’ theme. As you’d expect, there were precious few Indians in the mix as most of us, myself included, went for the far easier option of donning jeans and a check shirt. With every household drafted in to provide specific foodstuffs, we looked forward to a long afternoon of eating and drinking without the distraction of a four-legged food-guzzling appendage. Dudley didn’t go unchecked mind as I regularly shuttled back and forth to the fridge for beer like a helicopter resupplying a battleship. On every occasion, the hound looked surly and aloof and I suspect he was sulking. By late afternoon, the food table resembled a school canteen at the end of lunch, with wrappings scattered everywhere and soiled cutlery abandoned on a funeral pyre of semi-soggy paper plates. Thankfully, our culinary offerings – two home made cakes I might add – had been devoured with Labrador like efficiency, as nobody should suffer the ignominy of seeing their baked goods left on the shelf like an overlooked Christmas decoration still hanging around in March. Following an abridged sports day of welly-wanging (who knew this intrinsically simple pass time could be so complex and skill based) and assault course relays, weary adults retired to the sanctity of a hay bale or bench to slake their thirsts. It was at this point that it happened. Like a scene from a Californian shark attack, small children and nervous adults suddenly scattered as a shady lion shaped silhouette roamed languidly down the street, darting left then right with confidant stride. A yard or two nearer and it became clear that this mysterious creature appearing through the early autumn dusk was in fact a chocolate Labrador, though with two very similar looking beasts on our street and our front door supposedly closed firm, there seemed no rush to claim ownership. That split second of self-denial on my part unleashed dastardly consequences as Dudley, progress unchecked by negligent owners and an unlocked door, was homing in on a small child and his balloon with the closing speed of a hunting cheetah. In an instant, the boy was skittled sideways and sent crashing into a hay bale like a scene from a stock car race whilst his treasured balloon burst at Dudley’s first deft touch. With the party atmosphere deflating as fast as the child’s balloon, damage limitation began in earnest. Expecting a kangaroo court and summary justice, I grabbed Dudley and surveyed the wreckage. Like a weeble, the crying child was righted in an instant and scanned for damage by attentive parents. What followed surprised Dudley and I, as the child was thrust at the hound and forced to stroke him and look like he’d enjoyed it. It turned out, quite sensibly I thought, his parents were keen to ensure their little boy did not develop any lasting fear of dogs at such a young and tender age. That said, to those out of earshot and doubtless influenced by an afternoon of booze, this must have looked like an excessive form of ‘victim-offender’ rehab of the type you’d expect in Scandinavia or the low-countries. Within minutes, the party atmosphere had returned and Dudley became quite the celebrity owing to his Houdini like antics. Spotting an opportunity to trade on this unexpected goodwill, I casually hit up a neighbour or two for dog walking favours as well as taking the woofer on an extended tour of the party. At one point on this short semi-circular route, I imagined us both to be on a drug patrol at an airport, I in SWAT cap and packing heat, he a highly trained beast ignoring everything but the faintest traces of narcotics. Then Dudley burst his second bubble of the day, this one mine, as he squatted down at the kerb-side and pushed out a half-kilo turd not ten foot away from the now depleted food table. Bending to bag up the offending stool, cries of “ooh that’s massive” could be heard coming from the other Labrador owner on the street, though I must confess I struggled to harness the competitive element this statement offered me as I contemplated the merits of deploying a second poo bag. With the mess cleaned up, I trudged wearily back to the house, all previous SWAT team fantasies now ended and my imaginary side arm replaced by a weapon of a very different kind. What a great pic of a fantastic dog. Ah thank very much. Too kind. 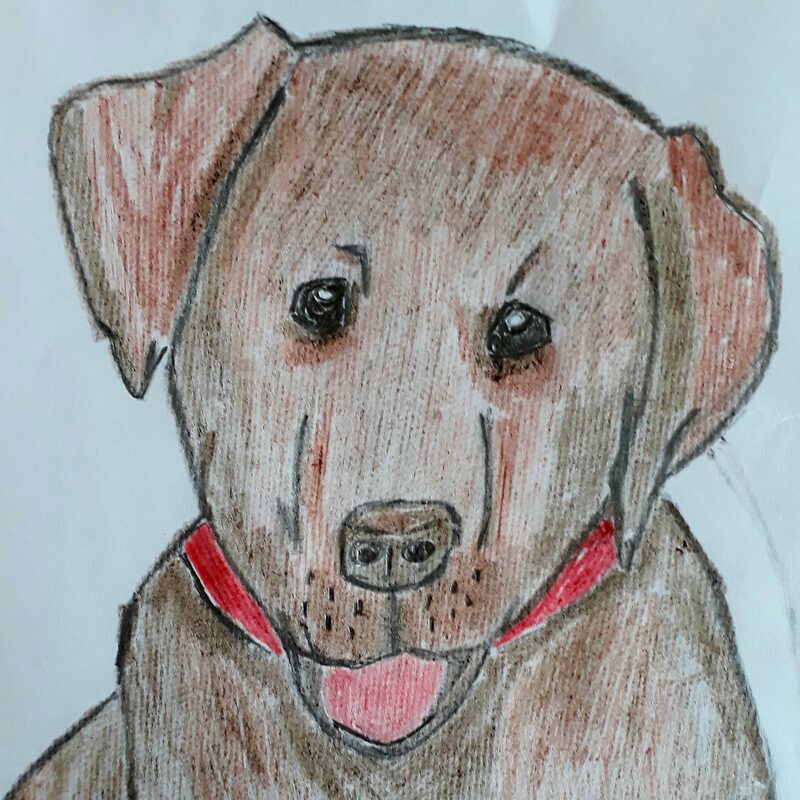 Loved your story and the beautiful picture of your Labrador pup!